Just north of Homosassa Springs is a town called Cutlers. In Cutlers (off or US Highway 19) you'll W. Ozello Trail (Also known as State Route 494). Very good, a few bridges and lots of twisties. Pecks Old Port Cove restaurant on the water out toward the end is a great place to eat - great food! on July 26, 2012 7 out of 8 members found this review useful. Probably the one road that the state of FL got right. Enjoyable little ride that is over too soon. This road should be no problem for anyone with moderate riding experience. The only thing to really watch out for is sand in some of the turns. on August 1, 2011 4 out of 4 members found this review useful. The Ozello Trail is a great ride as long as your paying attention to the road. Many of the corners have a decreasing radius and will "bite" you if you let them. The "Island Outpost" welcomes bikers and is a great place to gas up and enjoy some of the best BBQ in town. It is about half way through the ride and marks the beginning of the tighter corners. on February 8, 2011 4 out of 5 members found this review useful. Beautiful ride and love the twists and turns. Had lunch at Peck's Old Cove. Good prices and good food. Must try the clam chowder, it is outstanding and defintely home made.Great views of the water from the restaurant. We will certianly make this trip many times more. on August 18, 2012 3 out of 4 members found this review useful. I have rode this route many times live in the area. We probably ride it at least 3 times a year. We have ate at Pecks many of time food has always been good and service pretty good. There is also a place in side the little convenient store that serves barbeque been told it is really good and a cool place for a quick bite. on August 3, 2009 3 out of 3 members found this review useful. Good twisty road, more appropriate for sport bikes than the tourer I was on. Nice scenery and not to long a trip off the main highways. Virtually no development along the way and you soon get a feel of tranquility you can only find in such natural settings. Stopped and had lunch at Peck's Cove. Prices were decent for seafood and I found the almond crusted grouper some of the best I have had in Florida. Made the trip from just west of Orlando ( Clermont ) on country back roads which made for a nice leisurely hour and fourty minute trip. Highly recommend the trail and Peck's Cove, keep on riding. on January 5, 2009 3 out of 3 members found this review useful. on May 5, 2010 2 out of 2 members found this review useful. I ride this road almost every day. Some times I will take the bike out just to ride the trail and then go home. I love it. on April 16, 2008 2 out of 3 members found this review useful. on December 29, 2012 1 out of 3 members found this review useful. Great ride and wonderful lunch at Peck's. We will do this again soon!!!! on December 12, 2010 1 out of 2 members found this review useful. on November 22, 2010 1 out of 1 members found this review useful. Born, raised Floridian - new to motorcycles. One of the best rides of this part part of Florida enjoyed to date. I thoroughtly enjoyed the twisty curves and beautiful tranquil views...the dining was a topping! Highly recommend this route!! on January 25, 2010 1 out of 2 members found this review useful. 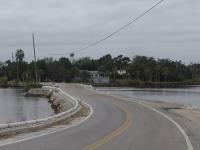 This has to be one of the best motorcycle roads in Florida. My wife and I did our annual vacation in Florida again this winter so of course we had to go back and do this ride again. We did this ride last year but didn't get a chance to eat at Peck's. It's amazing how busy this restaurant is at 2:30 in the afternoon on a Wednesday. There was a 15 minute wait to get a table, but definitely worth it. Good food and a good ride. Rode this Nov 21 '09 and it's all the previous comments state. A great ride! If I had more time I would have run it again. Word of warning about a parking lot at the foot of the bridge in the first photo. Graveled with marbles and challenging to turn in with a loaded top-heavy bike! on March 25, 2009 1 out of 2 members found this review useful. This is a treffic motorcycle road. I was convinced there wern't any twisty roads in Florida until we rode this one. We 're from Pennsylvania and vacation for two weeks in Florida in the winter. Didn't get a chance to eat at Pecks but it's on our schedule for next year. The Ozello Trail is a great ride as long as your paying attention to the road. Many of the corners have a decreacing radius and will "bite" you if you let them. The "Island Outpost" welcomes bikers and is a great place to gas up and enjoy some of the best BBQ in town. It is about half way through the ride and marks the begining of the tighter corners. on January 7, 2009 1 out of 1 members found this review useful. Lived in this area all my life, and still enjoy riding the Ozello Trail. Be sure to watch-out for wild hogs crossing early AM and late PM, the place is full of them. If you're out early on a Sunday, the Island Outpost (about halfway out) on the right has fuel, and the owner "John" serves up a mean breakfast. Sea-Ya! on October 18, 2008 1 out of 2 members found this review useful. I just rode this ride after your recommendation, taking 41 North from Tampa, and 98 towards crystal river and had a wonderful ride. Thanks for the suggestion! I had a great meal and really enjoyed route. on June 15, 2008 1 out of 1 members found this review useful. We rode our VL 800 C50 to the trail after checking this site out. It was worth every mile, so much nature all around, it's one of best places in Central W. FL we rode so far. We took lots of pictures. From Orlando we took US 27 to SR 44 to US 19, the way back S. US 19 then SR 98 (Beautiful country road) to 50.
on January 5, 2019 0 out of 0 members found this review useful. Rode this earlier today (Saturday)...the road itself scenery is very nice, but the ride was disappointing. Let's start with the fact that the entire trail is only 9mi long. It's over very quickly. Add all the trucks towing boats toward the boat launch at end of the trail, and suddenly you're doing 30mph most of the way, and passing here is quite dangerous and is legal only in a couple spots. Food at Peck's Port Cove was the best part of the day. Might be better if you get here super early in the morning, but not sure. on April 9, 2017 0 out of 0 members found this review useful. Beautiful road, however be wary of the road quality. Not sure why it's rated so high, there and quite a few bumps, ridges, and ripples mid-turn. Which can be an issue if youre trying to pick up the pace. Just be careful, other than that the area is gorgeous and be sure to stop at Peck's old Port cove! on March 1, 2017 0 out of 0 members found this review useful. As far as twisties, this is the best I have see in Florida. Very good road. smooth sweeping turns at first. As you near the gulf the turns can get tighter. Bring a picnic lunch at the end there are shady areas with tables to enjoy the gulf and watch some boats. on November 5, 2016 0 out of 0 members found this review useful. on June 29, 2016 0 out of 1 members found this review useful. Might be my favorite ride in Florida, I'd give it more than 5 Stars if it was longer. on November 29, 2011 0 out of 1 members found this review useful. I ride this road several times a year. Peck's out near the end of the road is a great place to eat. Then you get to retrace your route back out to US 19. I have seen a few bikes off in the marsh, so don't let this little road fool you! on February 9, 2010 0 out of 2 members found this review useful. I rode up from Hudson on US19. It was a nice ride with some good twist and some good old Florida scenery. Me and My Friends went out to Cutlers this weekend and had Great time. The Drive was a little long from Tampa but the open Roads getting there was a sweet ride (there were bear crossing signs...that was cool). We heard about the curves on the Ozello Trail and it lives up to its Rep. If youre a young rider like me, you just have to respect the roads but you will have a blast. I recommend to save your appetite for The Pecks restaurant it adds to the experiences and the food is great. on November 11, 2008 0 out of 2 members found this review useful. My husband and I rode this trail a few months back and we really enjoyed it. The scenery was awesome. We took U.S. 19 North and made a left onto Ozello Road. It was an easy, short, convenient, scenic ride. on May 19, 2008 0 out of 1 members found this review useful. We rode this May 16th. Very nice ! Loved the road ! Nice bunch of tight curves. Good and smooth. Not a lot o traffic for a Saturday. Peck's at the end was okay, service not so much. Mind the parking lot, loose gravel, very slippery.